When looking for a definition we are unsure of, we seek the answer in the dictionary. We have learned, though, the dictionary is ever changing as we, the people, create new idioms or use words once considered “slang” and now considered common. Consider the correct use of the word; anxious. Many people use it as a form of expressing anticipation and eagerness for a meeting or event. i.e. I’m so anxious to meet you. However, the definition of anxious actually means; afraid, nervous, showing fear, or feeling anxiety. Thus the correct word for expressing happy anticipation is eager. i.e. I am eager to see you again. Interesting, right? Now consider the definition of pharmaceutical. We think of pharmaceutical as being related to drugs, medicines or pharmacy. However, just a few short years ago, that was not the Webster’s definition. In 1968, Websters defined pharmaceutical: to practice witchcraft or sorcery. In my parent’s 1979 Webster’s Dictionary (photo above) it is defined: to practice witchcraft or use medicine. 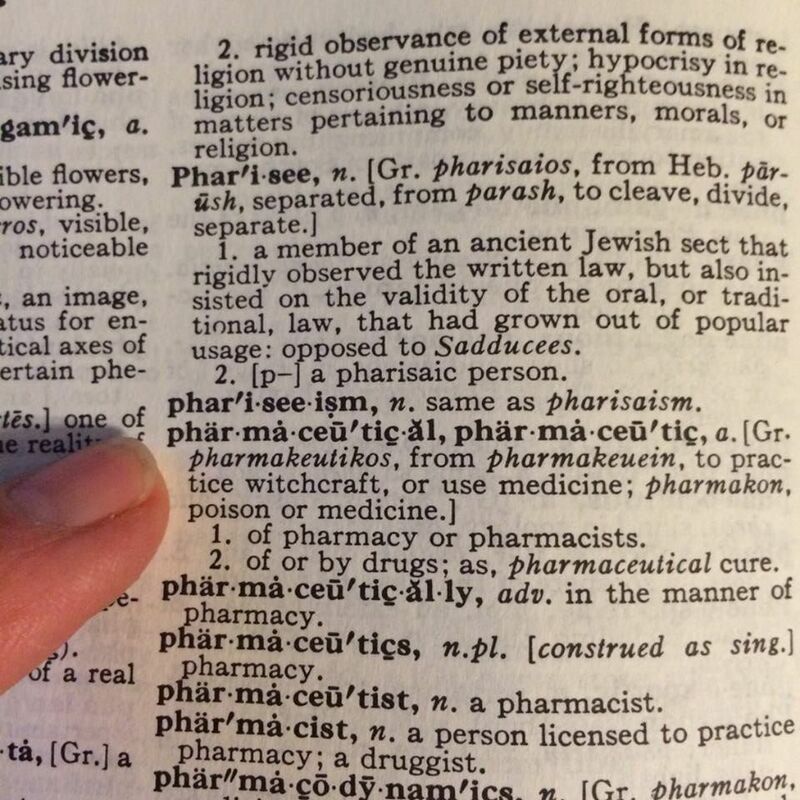 The same dictionary defines pharmacon: poison. So, what’s changed? Certainly we cannot argue medicine or pharmaceuticals are improved such that we now have removed the definition poison and/or witchcraft. Quite the contrary. We have an incredible number of class action lawsuits against many different pharmaceuticals and new suits arise every year. What’s changed? It’s our acceptance and usage. As the percentage of American’s using pharmaceuticals increased year after year one could hardly ignore the definition no longer spoke to the masses, right? How many physicians would approve of Webster’s defining the majority of their practice as witchcraft and sorcery? How many patients seeking the latest and greatest pill for what ails them would approve of their prescription for poison? How many people would approve of the majority of our TV commercials advertising better ways to practice witchcraft with the best poison? Really…. think about it! Every pharmaceutical has a side effect (or six). Often, the side effect is a worsening case of what you have initially. Sometimes, the side effect is the opposite of what you are seeking. Sometimes, the side effects are such that your body must be monitored for failure of another body system. Not because your original ailment would cause that other system to fail, but the medication will!! The body is designed to heal itself. When we fuel it with healthy foods full of wholesome enzymes meant to help the body restore itself…when we hydrate our cells, tissues, fluids and organs such that they perform as designed… and when we rest and refresh our bodies… our bodies will seek to heal and regain balance. An imbalance always has a root cause. Discovering the root cause enables a quicker and more successful pathway to wholeness and healing. Please… Take a few moments to think about pharmaceuticals (medication) and see if you can find one that actually cures a disease or illness. Not something that just masks the symptoms, but truly cures. I’m pondering…..but so far…. not one! Insulin, for starters. Life without insulin for type 1 diabetics = death. Donna, I understand your thought. Insulin, though valuable for type 1 diabetics, does not cure diabetes. Edgar Cayce told us the cure for Diabetes. Look it up. As you said Doctor’s are “practicing”. They don’t know what the underlying cause of your health issues are. What they know is the issue presented. So they medicate that issue only: Overlooking the other 20 symptoms you may have presented to them in the past, or the medication you are taking at present. Whatever fits in the slot is what they see. So, you may have a disease you’ve had for years but have not been treated for it for years cause the doctor is only practicing medicine. You’ve heard of people being treated for something simple for years but then changing doctors for whatever reason, and finding out they were taking all the wrong medication for their disease. Doctors are just practicing. If you are lucky enough to find a doctor that actually listens, and gives a care you are one of the lucky few. Even if you are not having any luck with holistic medicine it may possibly be the type holistic medicine to be used for one thing, wherein it’s the not the root cause of the issues. Let me give you an example, I hope it fits, so you know what I’m trying to say. I have an ear ache. I take medicine for the ear aching. But, it’s not the problem with the ear, it’s a problem with the tooth causing the ear to hurt. So, the ear aching medicine, whether holistic or prescription, will not take care of the ear ache. Does this apply to your pharmaceutical comments?